Some sunshine after this depressing last post! Cambodia’s coast has some long white beaches and a few not-yet-developed islands. 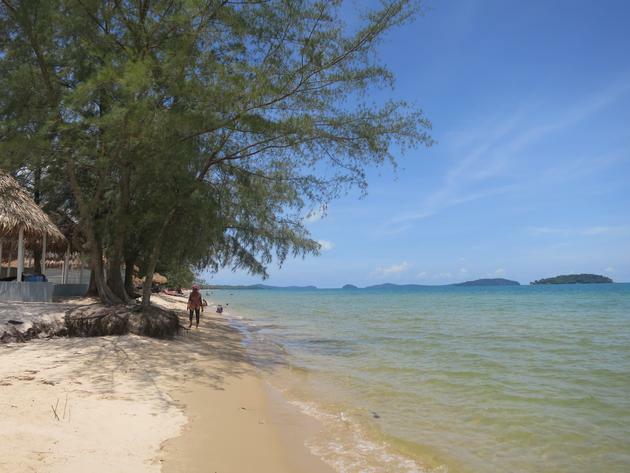 While not as beautiful as the islands in Thailand, the beaches of Cambodia are much cheaper! 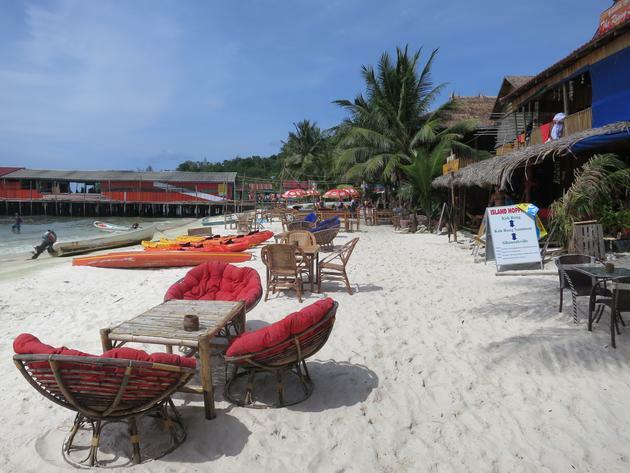 Sihanoukville is surrounded by a few beaches and has a large choice of accommodations and restaurants. I found most of the beaches to be not as clean as they could be. Apart from Otres Beach, they are also pretty crowded, especially Occheuteal and Serendipity Beach. Expect some loud music coming from all the bars along the sand. Otres Beach was clearly different from the rest. Offering a much led back atmosphere, it’s also more pretty and less visited. Although it’s a 10 minute drive from town, it’s easily accessible if you rent a scooter (5$/day) or via Tuk Tuk (4$/ride). The town has a wide range of restaurants but I would recommend having dinner at Happa to taste their delicious teppanyaki and a drink and/or dinner at The Deck in the Sokha Beach Resort, a 5-star hotel. Sihanoukville is also the only place to get a ferry to the Koh Rong island (5$ return). While it offers a good number of accommodations and places to eat, we are still talking about a very small place. There are no roads for example, everything being along the beach. Electricity is provided by generators and is off most of the day. As everything needs to be transported from the mainland, staying on the island is not cheap, basic bungalows starting at 20$/night. One advice: book in advance (it’s easy to do in Sihanoukville). 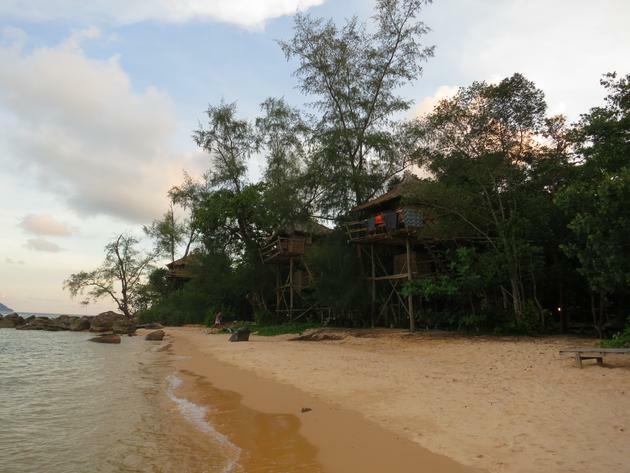 I stayed at Treehouse Bungalows which is located and the end of the main beach, away from the bars near the jetty. It’s a beautiful and very romantic place. The night sky is amazing with no lights polluting the horizon. Although I had planned to stay two nights, the trip was cut short after the horrid first night. No electricity means no fan means stagnant 35°C air. Very hard for me to sleep in these conditions. It seems I wasn’t the only one as most of the people who arrived on the same boat as me where again on the same boat the next morning. 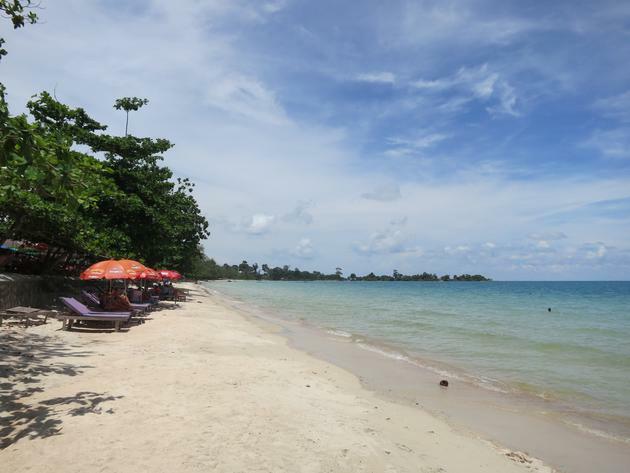 If some beach time is not what you’re looking for, avoid Sihanoukville as there’s nothing else. However, staying a night on Koh Rong while it’s still a secluded island may be worth it as it’s said that it won’t last long.